You are currently browsing the Columbia Hearing Center blog archives for April, 2015. 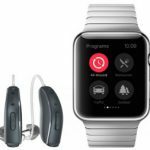 ReSound has introduced the first hearing aid app designed specifically for Apple Watch, according to an announcement from the company. Available immediately to Apple Watch wearers, the ReSound Smart app for Apple Watch offers a new experience that allows users to take advantage of seamless, on-the-go control, right from their wrist. The company says its ReSound Smart app for Apple Watch marks the latest of its efforts to bring forward-looking solutions and greater levels of empowerment to people seeking to take control over their hearing loss. 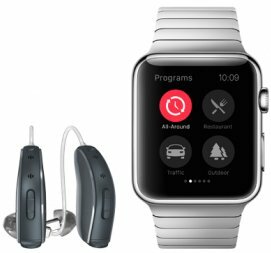 Through the ReSound Smart app for Apple Watch, users can set preferred volume levels, adjust treble and bass settings, change audio presets as they move through different sound environments, and view at-a-glance details about their hearing aids. Users with ReSound LiNX2 can also experience smart hearing customization with easy access to sound enhancer controls for comfort in noisy or windy environments. On April 27, the Institute of Medicine (IOM) will hold a meeting and open session on “Accessible and Affordable Hearing Health Care for Adults” at the Keck Center of the National Academies in Washington, DC at 10:30 AM Eastern. As described on IOM’s activity information page for the April 27 meeting, it is categorized as a “Consensus Study,” which provides background on the importance of hearing to individual and societal health including issues such as isolation, social connectivity, well-being, and economic productivity. It will examine federal regulations for non-surgical hearing aid dispensing by asking if current regulations provide a clinically meaningful benefit to adults with hearing loss and what the required federal regulatory paradigm should be. The study will also address the affordability of non-surgical devices and services. It will look at how affordability can be improved, how current approaches can be used or modified to increase access, how new and innovative approaches (such as telehealth, mobile health, and team-based care) can be used to increase access and affordability, and will discuss challenges for select populations such as older adults and transitioning young adults. The committee will provide short- and long-term recommendations for solutions to these questions. As mentioned by Dr Frank Lin during his keynote presentation at the November 2015 ADA Convention in Las Vegas, the IOM workshop is extremely important because it provides a top-down governmental response to the issue of affordability and accessibility of hearing aids, which he predicts may affect change much faster than a clinician-to-government bottom-up approach. We’ll provide more information on this topic after the April 27th IOM meeting. Up to 360 million people worldwide have impaired hearing, according to the World Health Organization and nearly 45 million people have Alzheimer’s or another form of dementia, according to Alzheimer’s Disease International. In 2013, Lin published a study in the Journal of the American Medical Association, showing that older adults with hearing loss were at greater risk for problems with thinking and memory than were people of the same age who had normal hearing. In the study, Lin found that the cognitive abilities of participants with hearing loss declined up to 40% faster than other participants. A few theories as to why have gained ground in recent years. First is the idea that hearing loss imposes an extra, detrimental workload on the brain. Another theory is that hearing loss may cause parts of the brain to atrophy. In a study published in 2014 in the journal NeuroImage, Lin and his associates found that people who have been diagnosed with hearing loss for at least seven years were more likely to have brains with smaller lateral temporal lobes, which are involved with retaining visual memories, processing and deriving meaning from sensory input, and storing new memories. The excellent help I received was exceptional. Also being elderly, I very much appreciated their patience and understanding of my problems. Now I hear all the sounds I missed for so long. According to a recent announcement from the University of Helsinki, Finland, listening to classical music enhances the activity of genes responsible for brain functions, including dopamine secretion and transport, synaptic neurotransmission, learning, and memory. A study by a Finnish team of researchers showed that listening to classical music down-regulated genes that mediate neurodegeneration, and up-regulated several genes also known to be responsible for song learning and singing in songbirds. The Finnish researchers report that listening to music represents a complex cognitive function of the human brain, which is known to induce several neuronal and physiological changes. However, the molecular background underlying the effects of listening to music is largely unknown. The researchers investigated how listening to classical music affected the gene expression profiles of both musically experienced and inexperienced participants. The research team found that listening to this music enhanced the activity of genes involved in many brain functions. One of the most up-regulated genes, synuclein-alpha (SNCA) is a known risk gene for Parkinson’s disease that is located in the strongest linkage region of musical aptitude. SNCA is also known to contribute to song learning in songbirds. In contrast, listening to music down-regulated genes that are associated with neurodegeneration, which indicates that listening to music may have a neuroprotective effect.